Many of our readers ask about automatic transmissions and what’s the best, the cheapest or the smoothest. The problem with automatic transmissions is that they can be quite expensive compared to manuals because they’re more complicated. Most luxury cars are fitted with automatic gearboxes because they provide a smoother drive and are more relaxing for the driver – vehicles like the Maybach 62 S, priced at an astounding £367,490. But you needn’t spend that much - there are small automatics on the market at low prices, and we’ve filtered through the data from our specs section to find the cheapest new models on sale today. 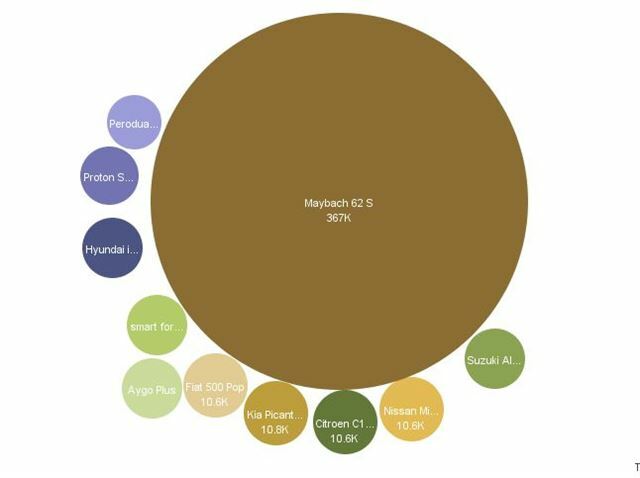 If you look at the bubble chart above you'll see that for the price of the Maybach S you could have all of the cars in this list a few times over! The Picanto may be in tenth place but it’s one of the best cars on this list. Manual versions start and below £8,000, but to get an automatic you’ll need to spend £10,795 on a ‘2’ version, which comes with a good level of standard equipment, including Bluetooth, electric mirrors and alloy wheels. More importantly, it comes with an excellent seven year 100,000 mile warranty. The Micra is worthy of note because it’s the only car in this top ten with a CVT gearbox, which is much smoother than torque convertor operated automatic or an automated manual. CVTs tend to be more efficient, which is why many hybrids are fitted with them. The drawback is that they can be noisy when accelerating hard. Without a doubt the most stylish car in the top ten, the Fiat 500 features a Dualogic gearbox, which is, as with many cars in this list, actually an automated manual transmission. Automatic manuals are cheaper to produce than torque converter automatics, and they sap less power from the engine, which is important when there’s only 69bhp to start with. The downside is that automated manuals tend to be slightly slow to change gear and a little bit more jerky. Another automated manual, this time called electronic gear shift (EGS). For many inner city drivers a car like the C1 is a sensible choice, and the addition of the EGS system makes for easier traffic jam driving, which is probably the main draw of all of the cars in this list. The EGS gearbox is only available with the top spec VTR+ model, and only with the smallest, 1.0-litre engine, which might put buyers off. In Japan it’s the norm for cars to be fitted with automatic gearboxes, and in the cars home market it is available with a CVT option as well as the four-speed automatic we get here. It’s reasonably priced and, while it’s not as speedy as its manual counterparts, it’s ideal for someone who wants a ‘real’ automatic rather than an automated manual. Another automated manual, but not the best. The smart can be sluggish to shift and has a tendency to lurch a little when finding the next ratio. Outside of town this can be frustrating, but in traffic, when speeds are low, it’s less of a problem. The Aygo is, for all intents and purposes, the same as the Citroen C1 above. It’s made in the same factory and comes with the same engines, so if you’re after a C1 with an automated manual gearbox but without all of the top trim gubbins that go with the C1 VTR+, this is a smarter choice because it’s £1000 cheaper. Probably the best value car on the list, the i10 1.2 Active comes with a generous standard specification including electric windows all around, iPod connectivity, electric mirrors, air con and, of course, a ‘proper’ automatic gearbox. Not only that there’s a five year unlimited mileage warranty which includes roadside assistance and health checks. The adage ‘you get what you pay for’ applies to this car and the car in 1st place. The Proton is one of the cheapest cars on sale, even with the automated manual gearbox, but it’s also built to a poor standard. Quality leaves a lot to be desired and the engine is based on an outdated Renault design. It might suit some people, but most would be better off paying more for the Hyundai. The Perodua won’t win many prizes for performance or desirability, but it’s not all bad news. It’s build on the same platform as the Daihatsu Sirion, which was developed with help from Toyota. So despite the curious name it’s not as bad as you might think. Unfortunately, it’s just not as good as the competition, so despite it falling into first place on price, you’d be better off buying something else. For other Data Bank features on everything from load space to performance, click here.